The following article was published in the October/November, 2000 Jewish Voice Newspaper in Sacramento, California and is reproduced and posted to this web site with permission. 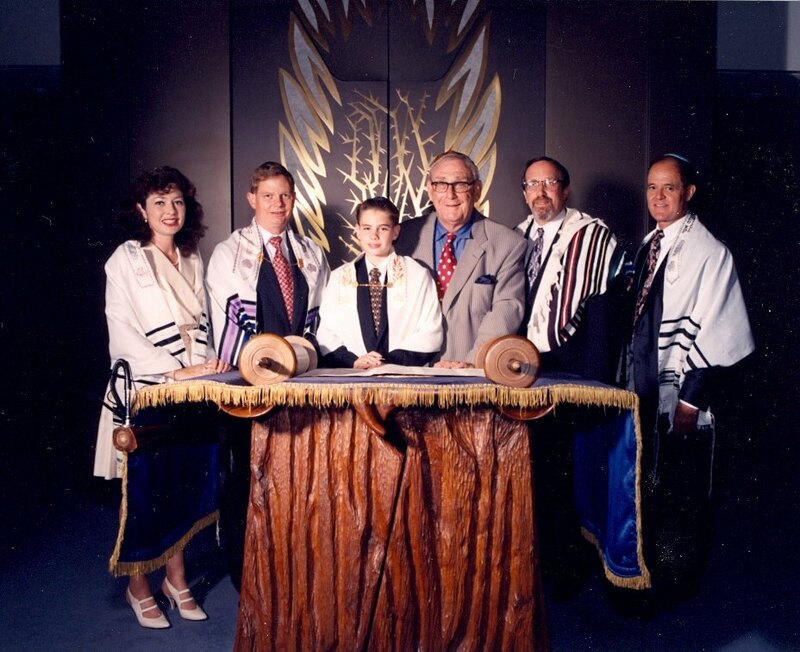 Our son, Jeremy Avidor Tamarkin, was a Bar Mitzvah at Mosaic Law Congregation on August 12, 1998. It is the custom of Rabbi Taff at Mosaic Law to require parents of a Bar or Bat Mitzvah to write a "parents' essay". On the second anniversary of Jeremy's Bar Mitzvah, we are publishing our Parent's Bar Mitzvah essay in Jeremy's honor and trust that it may be an inspiration to others. 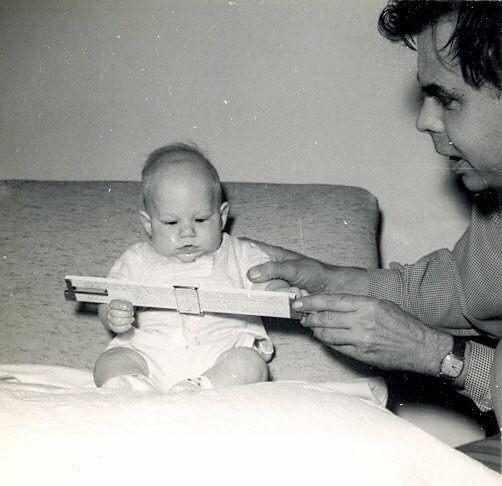 Tom receives his first slide rule lesson from his father Dr. Thomas E. Thorpe. I was born on August 24, 1953 in Phoenix, Arizona as Thomas Thorpe. My father was born in Mayer, Arizona on July 17, 1918 as Thomas Thorpe. Mayer, a small town about 65 miles north of Phoenix, was founded by my great grandfather, Joseph Mayer, in 1869. Joseph Mayer was a Jewish emigrant from the Alsace area between France and Germany. The original name was Mayerhoff. Six brothers came to the United States in the late 1840's. Four of them changed their name to Mayer; two of these moved to the Boston area, and two went west, one to Arizona, and one on to California. The two brothers who maintained the Mayerhoff name moved to the Baltimore, MD area. Although Joseph Mayer was Jewish, he married a Catholic lady and had four daughters prior to dying from a gunshot wound. One of these daughters, Winifred, was my grandmother. She had the distinction of being the first female to attend Arizona Normal School (now NAU, Northern Arizona University, in Flagstaff) and graduate with a Bachelor’s degree in 1912, the year Arizona was admitted to statehood. At that time, she was the only female in the state university system including Tempe and Tucson. 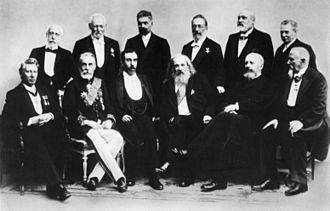 Sir T. E. Thorpe, top right, Berlin Academy of Chemists, 1900. Winifred Mayer, my grandmother, married Thomas E. Thorpe who was the never talked about in polite company (illegitimate) son of Sir Thomas Edward Thorpe originally from Harpurhey, Manchester, England. Sir Thomas Thorpe, Ph.D., University of Heidelberg, accepted various posts at the Anderson University in Glasgow, the Yorkshire College of Science, the Normal School of Science, and the Royal College of Science, South Kensington. He was an elected member of the International Atomic Weights Commission, president of the British Association and served as president of the Society of Chemical Industry. 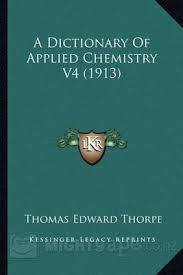 Sir Thomas Thorpe wrote well over 20 books, including the textbooks Inorganic Chemistry (1873), Dictionary of Applied Chemistry (1890) and a History of Chemistry (1909). Outside chemistry, his great interest was yachting, and he wrote two books on this subject; A Yachtsman's Guide to the Dutch Waterways (1905) and The Seine from Havre to Paris (1913). My grandmother was raised Catholic and my father was not at all religious. He taught physics at West High School in Phoenix from 1952 to 1967 at which point he completed his EdD and PhD degrees. He then accepted a professorship at NAU in the Physics Department. The last year my father taught at West High, he was the only high school teacher in the State of Arizona to hold a doctorate degree; let alone two. In that year, one of his students was Judy Finkelstien, now Judy Taff, of Sacramento, California. My mother was born in Saint Louis, Missouri. Her mother had the distinction of being the first woman to graduate from Washington University with a law degree, and the first woman to be admitted to the Missouri State Bar. She married an architect and never practiced. My mother's grandmother was born Jewish, however, she converted to Christianity at a very early age at the insistence of her father who was not Jewish. So, there is a history of mixed marriage in my family background, albeit, distant. I first became interested in Judaism at a very young age and for several reasons. Firstly, my father, not being a very spiritual man, had little respect for organized religion. He did, however, admire Judaism and always had very positive things to say about the Jewish people and the positive attributes of Judaism. Next, my best childhood friend in Phoenix was Jewish. His name was Steven Brown, son of Ed and Lillian Brown. Steve's dad was a founder of Congregation Beth Shalom in Phoenix, a member of the Beth El Congregation, and operated Katz's deli on Camelback Road. Steve and I were very close through high school. Steve was a Bar Mitzvah at Beth El in Phoenix. Shortly thereafter, Beth El recruited a cantor named Reuven Taff; now Rabbi Reuven Taff in Sacramento, California. In 1966, Mel and Beth Swartz moved next door to us and I immediately befriended Mel. As I grew older, I spent much time with the Swartz's and lived with them from time to time. As a teenager I was much closer to Mel than my father. I attended high school in Flagstaff Arizona. A history teacher there, Mr. Russ O’Niel had several tens of original old 16 mm newsreel films of the Nuremberg trials and the Holocaust. These films were unedited and, at once, both very disturbing and very moving. As a direct result of spending many lunch hours (the school would not allow these films to be shown in class due to their graphic and disturbing nature), I became very interested in the Jewish people and Judaism in the context of the Holocaust. How could such a thing happen? From that point on, I vowed to convert and marry a nice Jewish girl. Beth Swartz introduced me to Rabbi Maynard Bell at Temple Soel in Scottsdale and I knew Rabbi Barton Lee (and Marcie) at Hillel at ASU. 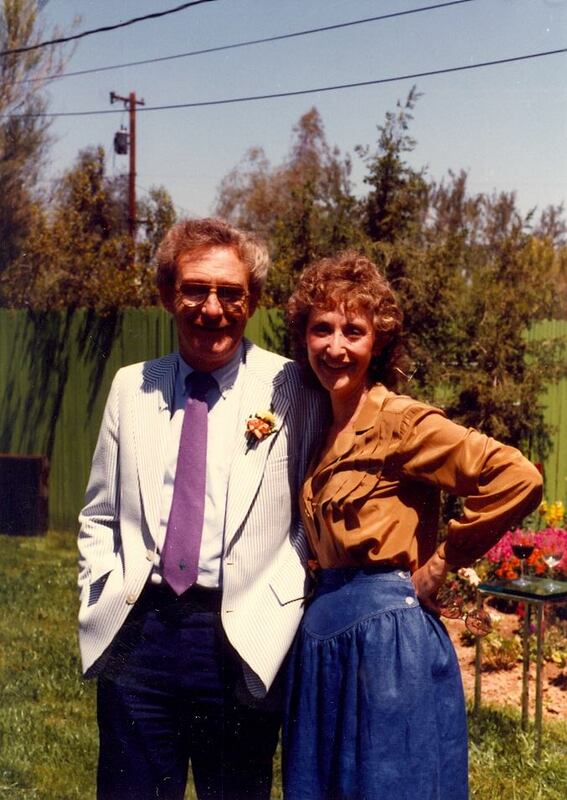 Melvin & Beth Swartz, at Emily & Tom Tamarkin's wedding at the Swartz's home in Scottsdale AZ. In 1981, I met Emily who had two children from a previous marriage. On April 18, 1982, we were married. By December 1984, she was pregnant with Jeremy. We moved to Dallas and met Rabbi Mark Goodman (Blessed be his name). The Rabbi converted me virtually immediately and worked with Emily, Stacy, and Jamie for about six months whereupon he converted all three of them at Temple Shalom. Two months later, Jeremy was born. From the Reform perspective, he was born Jewish and he had his naming ceremony at Temple Shalom. Jeremy was born on August 15, 1985. By September 1, 1985 we left Temple Shalom and became "conditional members" of Congregation Beth Torah in Richardson, Texas; Rabbi Neil Sandler. The membership was conditional on our "converting" to Judaism at Beth Torah with Bet Din and mikvah. We worked with Rabbi Sandler for almost a year and wrote a 100+ page paper on Judaism, which resembled a Master's thesis. Ultimately, Rabbi Sandler performed the "conversion." All five of us "converted". Jamie and Stacy attended religious school at Beth Torah and were Bat and Bar Mitzvahs there in 1987 and 1989, respectively. Then we became members of Tifferet Israel, the large Orthodox Shul in Dallas. In 1991, Rabbi Stewart Weiss performed an Orthodox "conversion" for Jeremy and myself. The Bet Din was composed of Cantor Cohen, (now the Rabbi at Tifferet Israel), Mr. Malcha, the Shul's caretaker, and Rabbi Weiss. Rabbi Weiss was going to work with Emily over the course of the next year, but he left the Shul and Emily did not pursue an Orthodox conversion. Rabbi Weiss required her to assume a working knowledge of Hebrew, be 100% shomer Shabbat, and move within walking distance of the Shul to maintain the integrity of Shabbos and attend Saturday services. In 1994, we moved to Auburn and joined Mosaic Law Congregation. The next year we moved to Reno, Nevada and joined Temple Emanu-El, the Conservative Shul in Reno. In February, 1998 we rejoined Mosaic Law Congregation and drove from Reno to Sacramento for five months to attend services. 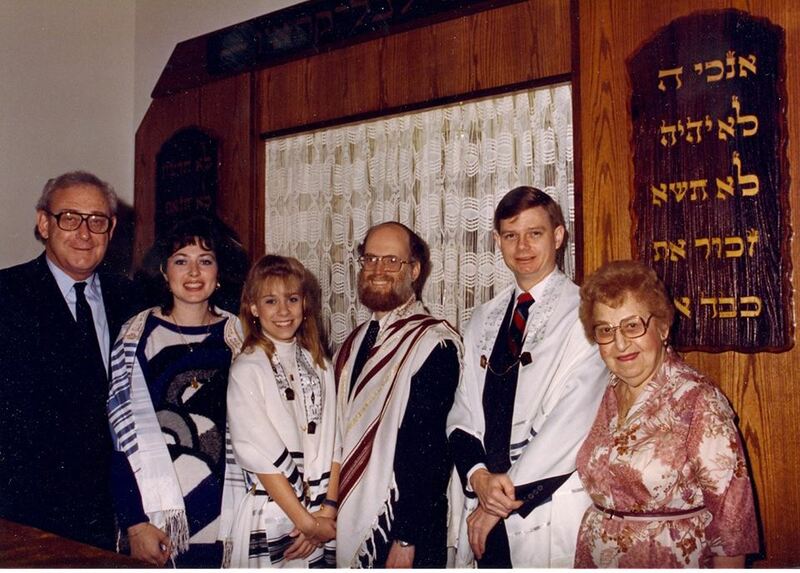 In August, 1998, we relocated the family and business to Carmichael, California to be closer to the Shul. At the beginning of this essay, it was stated that I was born Thomas Thorpe. 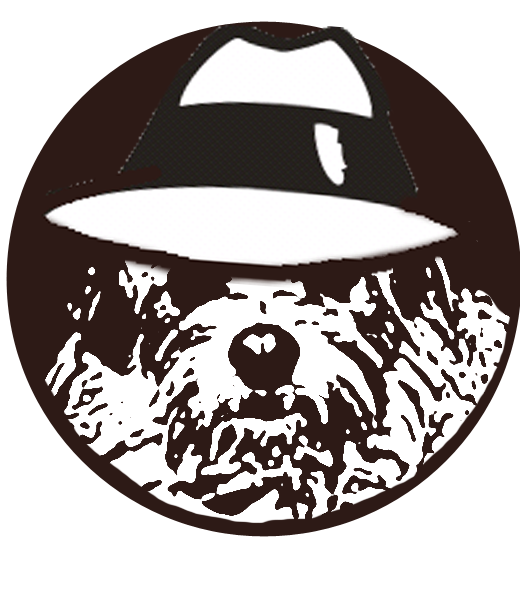 So where did Tomer David Tamarkin come from? Emily and I decided that we did not want Jeremy to have the stigma of "convert status" given his surname and Irish features. In 1986, we decided to legally change our name. On Jeremy's first birthday, we filed the documents in court and two months later the Judge signed the legal documents changing my name from Thomas Thorpe to Tomer David Tamarkin, Emily Thorpe to Emily Tamarkin, and Jeremy Thorpe to Jeremy Tamarkin. Of course this was announced in the Dallas papers as a legal proceeding. Not everybody reads the legal notice section of the paper and we did have a very embarrassing experience at the synagogue on Erev Shabbat. Rabbi Sandler forgot to make an announcement to the congregation as he promised regarding the name change, and he called Emily and me to the Bimah for a responsive reading. When he called us, he did so as Tamarkin. After the service, a number of people came up to us and said that they were confused in that they thought our name was Thorpe. When Mikhail Gorbachev came to the Washington DC in 1986 I flew to Washington with a delegation from Dallas to protest Jewish human rights in Russia. Emily worked for the Jewish Family Services arm of the Jewish Federation in Dallas. My grandmother was married to Thomas E. Thorpe, Sr. for only three years. He was an only child. They had two children together and were divorced thereafter. Neither my grandmother nor grandfather remarried. My father’s brother had two sons, neither of which had any children. The Thorpe line has ceased. Both my father and mother have passed away. The Thorpe line has been reborn as the Tamarkin line. Jeremy, whose Bar Mitzvah was Saturday, August 22, 1998 at Mosaic Law Congregation in Sacramento, California is the first person in our family to be "born Jewish" and therefore is very special. Although Jeremy was born Jewish in the Reform movement, he "converted" twice thereafter. 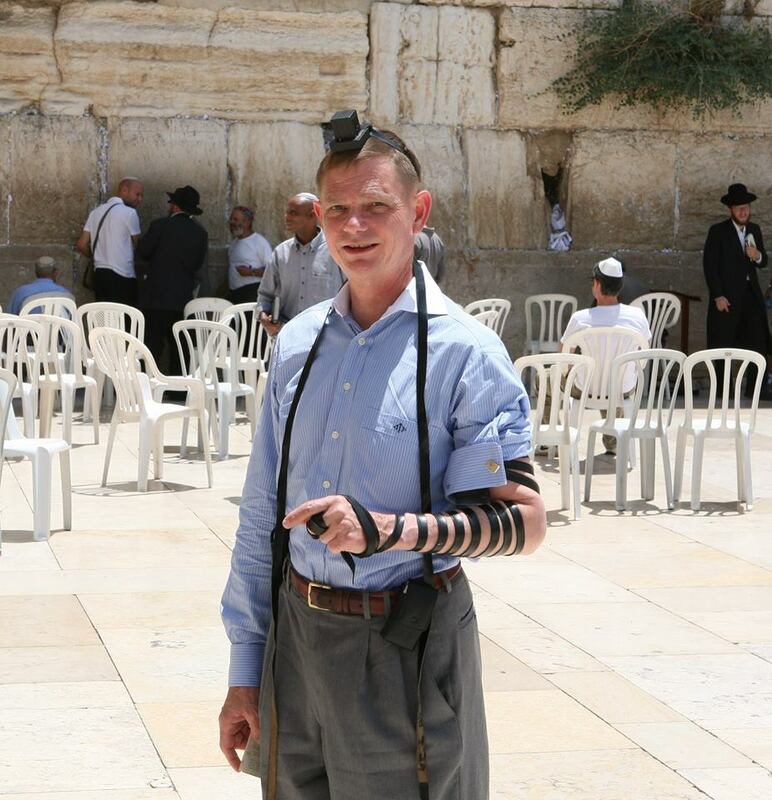 Once in the Conservative movement and once in the Orthodox movement as did his father. Thus Jeremy is 100% Kosher, no matter who you ask. His Orthodox Conversion Certificate is on file with the State of Israel.